I love it when I can take something practical and add some embroidery to it - or embroider something and turn it into something practical. Whichever way you look at it, it always makes me happy when I can pull it off. 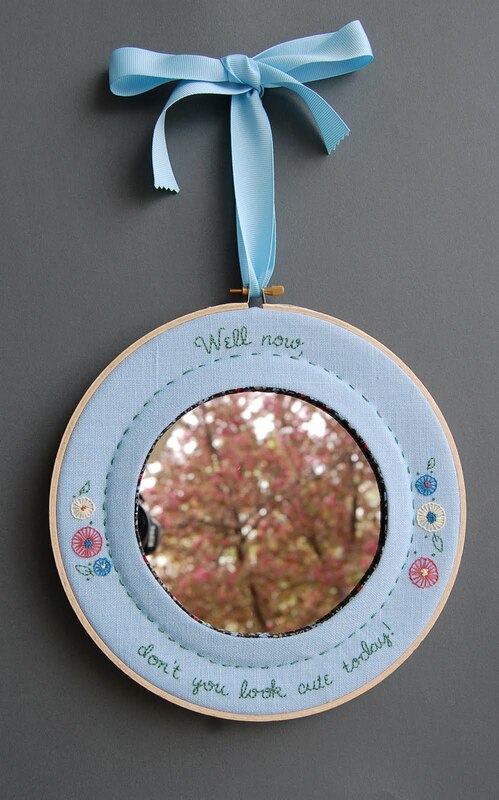 I had this idea recently to make a hanging wall mirror framed in an embroidery hoop. It would be perfectly fine if it were made with a pretty cotton print but you know me, I had to add some embroidery just for fun. This one says, "Well now, don't you look cute today!" Who wouldn't want to see that when they looked in the mirror? 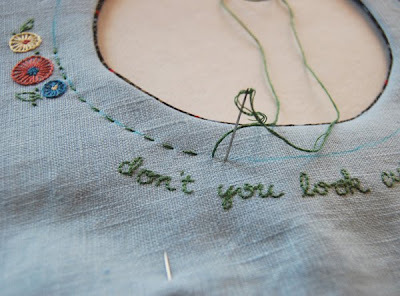 If you plan to add any embroidered accents do your stitching before you cut your fabric. 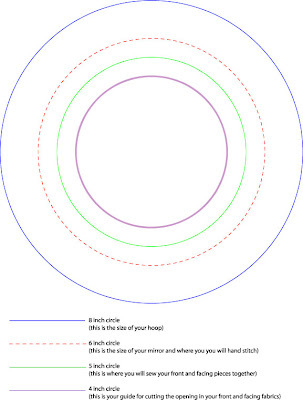 Be sure to take into account where the hoop and the mirror will be placed. Pin the facing and the front fabric together - right sides together. 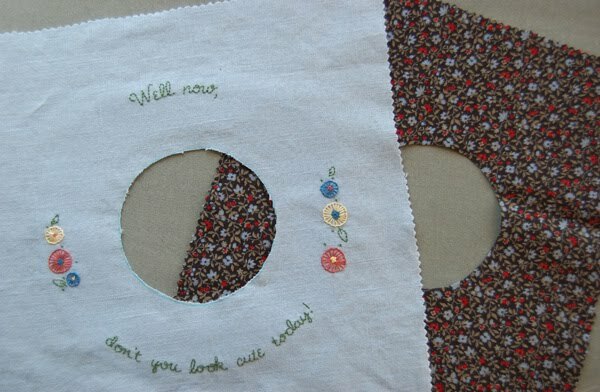 Sew the fabrics together 1/2 inch from the circle opening. Because I used interfacing on the back side I simply followed the edge of it as I stitched. 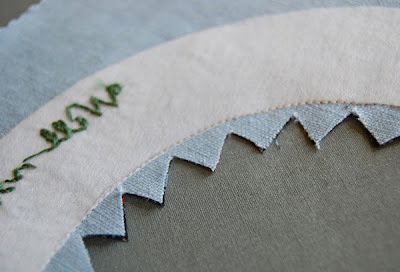 Cut notches just up to the seam line taking care not to cut into the seam. This will help your fabric lie flatter. 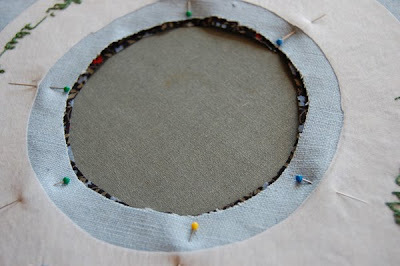 Turn the facing fabric under through the circle opening so that the wrong sides are now together. 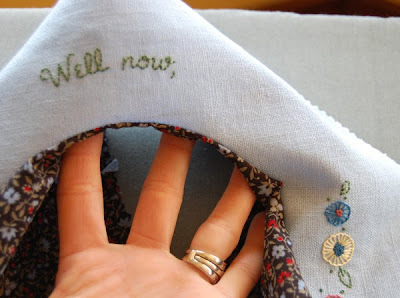 Give your fabrics a quick press. 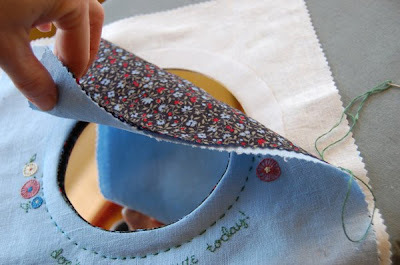 Layer your fabrics with the backing fabric on the bottom and pin them together. 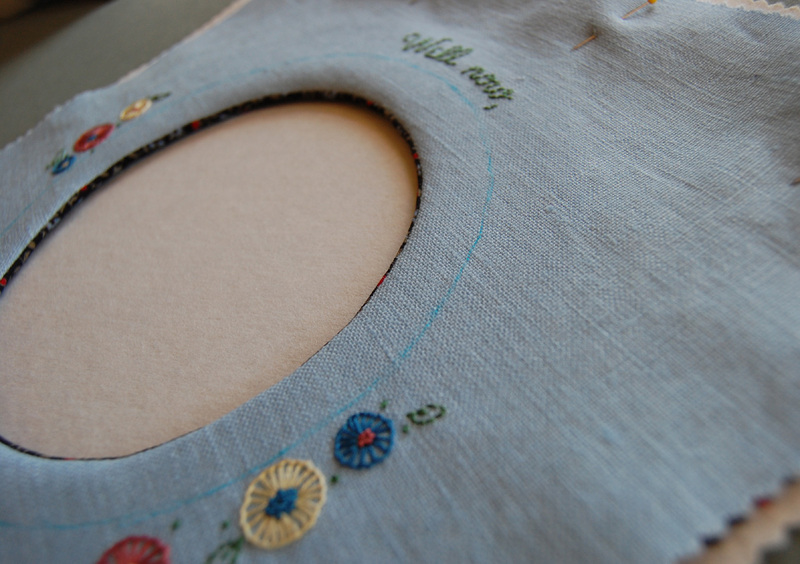 You will be stitching a line 1/2 inch from the mirror opening. I used a water erasable marker to mark my stitch line. Start stitching along your stitch line. Only stitch half of the circle because you still need to insert your mirror. 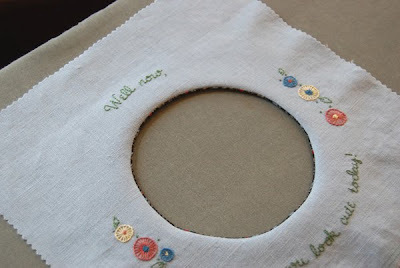 After half of the circle is stitched insert your mirror and carefully finish stitching around the circle securing the mirror in place. 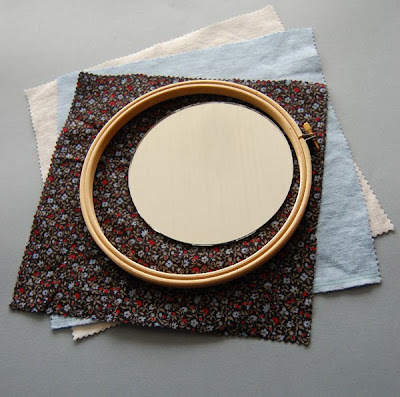 Finish your mirror by securing your fabrics in your 8 inch hoop. 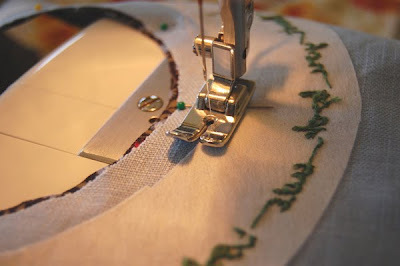 You could trim the excess fabric on the back or use a running stitch along the edge and cinch it tightly to keep it gathered in the back. I used a matching grosgrain ribbon as a hanger. I would love to try this with some different embellishing techniques - maybe add a topstitch around the mirror opening, use some felt flowers or buttons, or even a patchwork design for the front. As usual, I have more ideas than I have time to try. If you try this project I would love to see how you made it special and unique! As with every tutorial I have posted: please let me know if any part of this is unclear or if you have any questions. Enjoy! I love this idea. It is so gorgeous. Somedays you really need a pick me up when you look in the mirror. Oh I love it! How adorable for my little 8 year old to check her hair in on the way out the door each morning! Gonna certainly add this to my list of projects-to-do! Thank you so much, Corinne! Can you say what font you used for the wording? this is such a creative idea! and with some heart, even. i love it, great job! I wish I could borrow the creativity part of your brain for a few weeks :). Oh, the font I used is called 'noodlescript'. Absolutely gorgeous - I love it! I'm definitely going to try this out - I just need to find a 6" mirror! I *love* this! It's so, so creative! Thanks so much for the fabulous idea, I'm so glad you posted it! I'll be linking. ohhh these is so pretty and original idea!!! thanks for sharing! Fab idea! I am going to make one for my daughter, she always need to check her look before she goes anywhere! Love it, this is a great project, thanks so much for sharing!! great tutorial. i love it. do come and link it up here http://www.finecraftguild.com/diy-tutorial-linky-party-15/ so our readers can find you also. as well, if you want to do a free give away at a later date to promote your etsy shop, I'd be open to this as well, as I love your style. It's unique. as well, the diy craft tutorial party is opening an new linking every wednesday. What a great tutorial and I love the end product. Came over from Allie-oops blog.